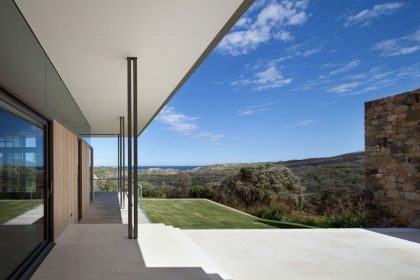 Located in South-Western Australia, The private residence reflects an approach which distils built form as an expression of landscape and newly formed places connected to place. 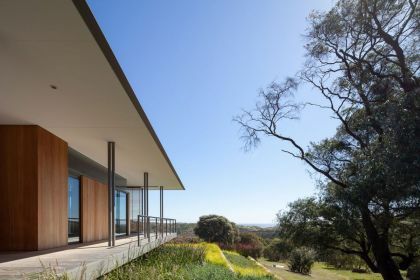 As such, the project displays the paired ideas of meandering and built formality, reflecting the relationship between the natural contours of bushland (emblematic of the site’s iconic Margaret River view, with its rolling river headland) and the crisp horizontality of the ocean beyond. 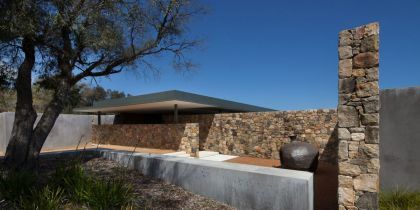 The entry approach intentionally wanders through a forest of eucalypts and willow myrtles, guided beyond the turn by low stone walls. 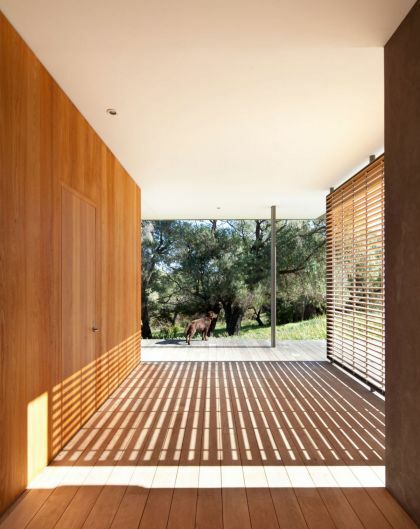 These site walls contain the folding landscape and lead visitors to an open court for arrival. 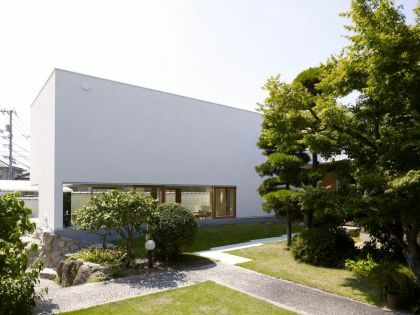 Flanked by trees and landscape, the approach to the residence and its distant views beyond are hidden both by forest and walls, becoming larger in height and scale at entry. 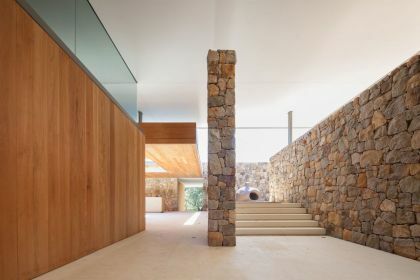 These stone walls, constructed of locally quarried split boulders become the central spine of the design. 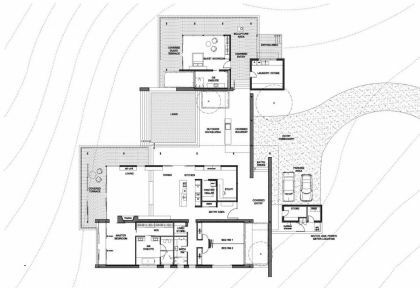 While defining a generous sense of place, they conceal the house for discovery and provide a datum for which the residence’s rooms can be sited. 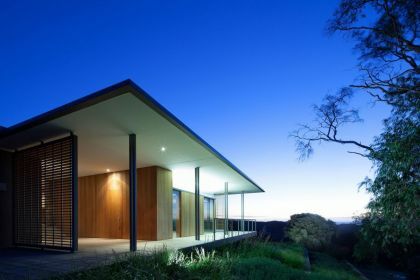 The house though concealed, is prefigured by a series of floating rooves above. 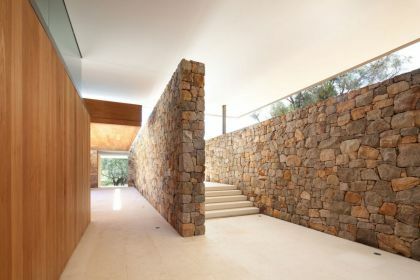 They orchestrate the visitor’s passage from a lower level entry forecourt through the stone walling. 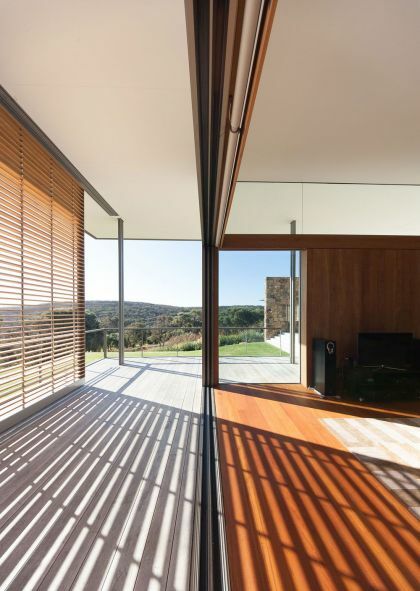 The scale borders on the epic, eliciting a sense of landscape rather than of the domestic house and shed. 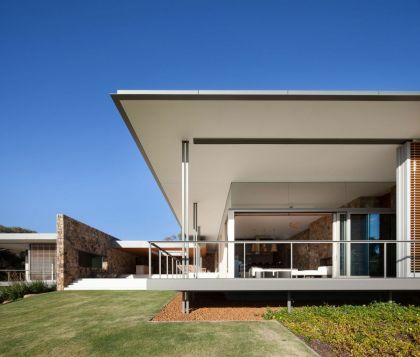 Upon entry, white canopies float above, sheltering and connecting two building wings. 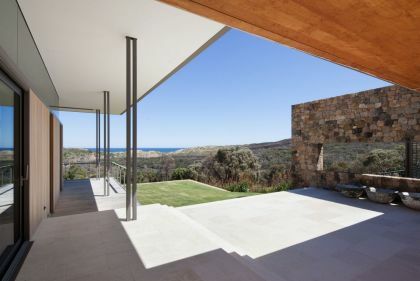 A central courtyard punctuates them, with each space carefully positioned to take advantage of the panoramic views of the coast. 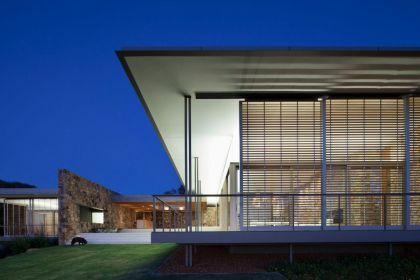 The magic of river and ocean become a revelation from the courtyard, its view framed by a feature site wall against the backdrop of its quarried walls and timber-lined canopy. 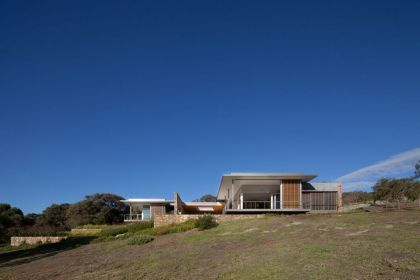 The rooves are transformed from a gesture at entry to expansive planes, echoing the breadth of landscape beyond. 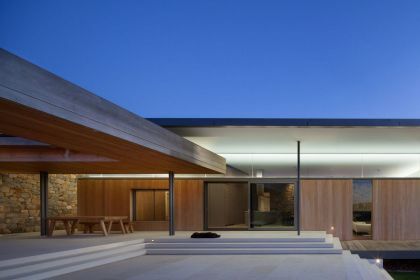 The glass ribbon of highlight panels above the house’s teak lined walls, emphasise the white lined soffits, washed in a reflected light by day and an up lit glow at night .The ceilings become a floating island contrasting with the olive backdrop of bush. 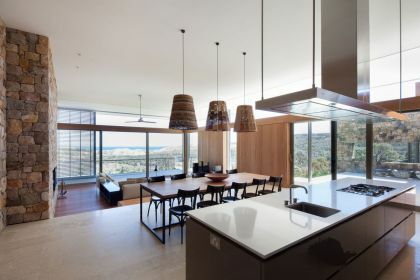 Once inside the living wing, the rubble site walls become background to the generously apportioned space contrasting the precision of honed limestone floors, teak lined panels and a meticulously crafted kitchen. 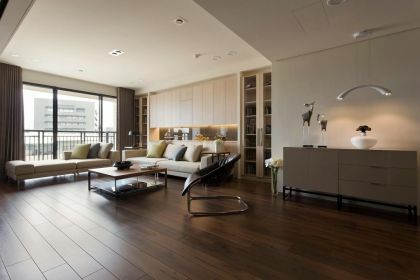 The light washed ceilings and floor toning highlight the teak panelling’s and adjacent timber thresholds natural lustre. 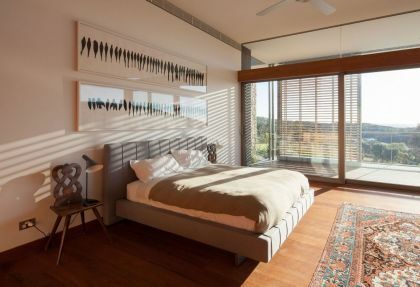 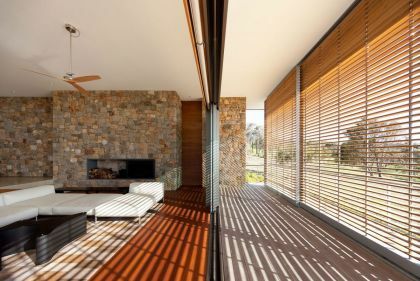 The interior steps to the lower surrounding balconies, patterned with the filtered shadows of the sliding timber screens. 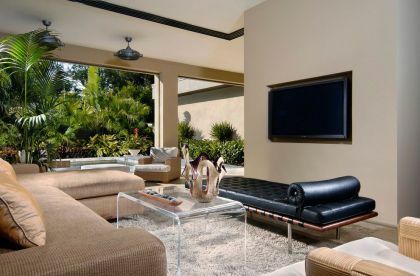 The outdoor living area courtyard separates the guest room wing, connected by a site wall and canopy. 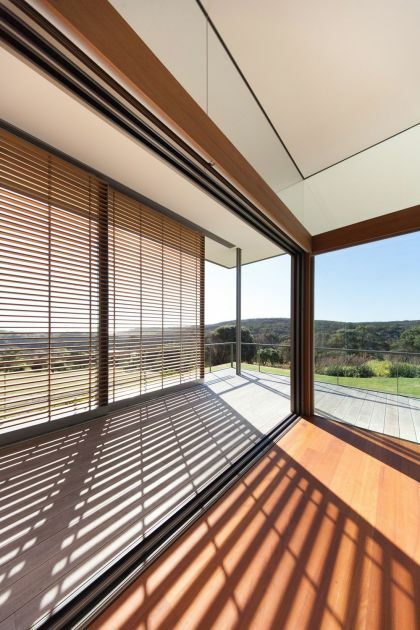 The wing’s timber lined walls to the exterior and interior reflect the hospitality of the client, with private landscapes and views provided. 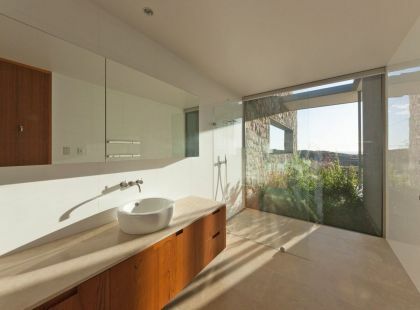 Central to the residence’s interior spaces are the bathrooms, visually connected to both the bedrooms and landscape. 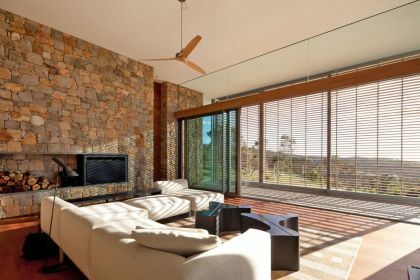 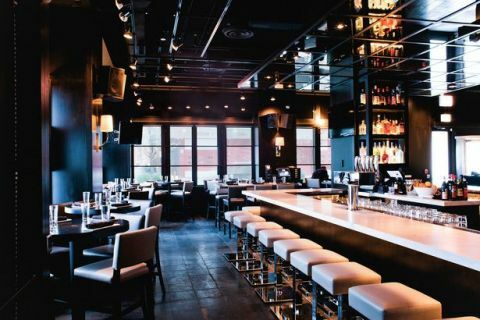 They are finely appointed in stone with furniture carefully detailed. 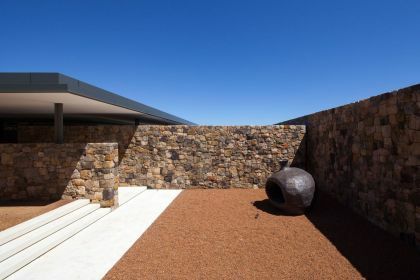 Landscape terraces planted with endemic species continue the stone walling from the residence to the landscape beyond, fusing the residence to the bushland site and continue the project’s recurring motif of formal articulation and wandering as a heightened experience. 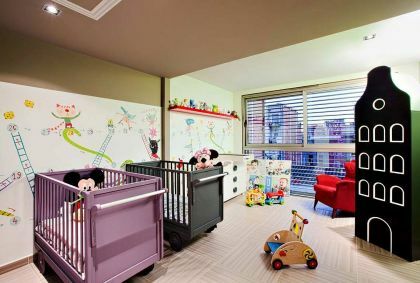 This is an extension project on a thirty-five year-old house for a daughter and her husband. 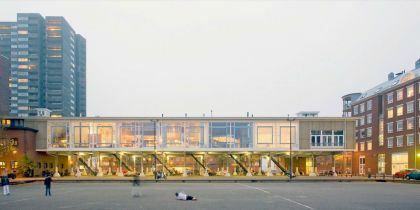 With the transformation of an old harbor-cantina on KNSM eiland in Amsterdam into large apartments, this building changed function but kept its identity. 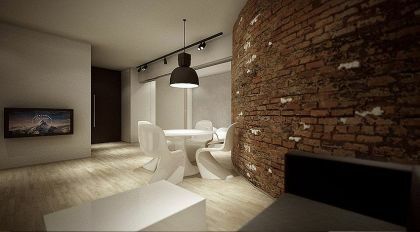 Apartment in Parque das N..
12 Feet Wide Family House.. 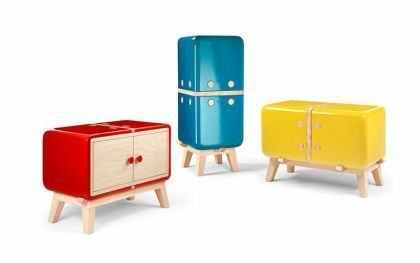 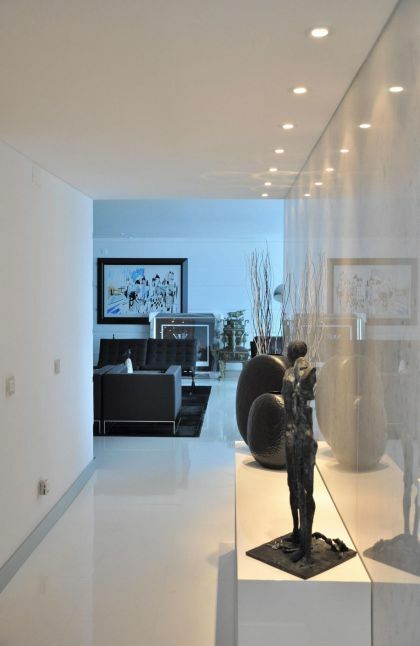 The house is situated in the heart of an old town district in Barcelona. 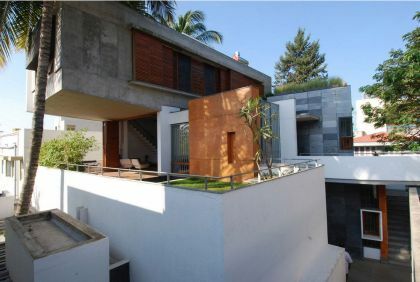 The urban grid of the area is characterized by small, narrow and long plots. 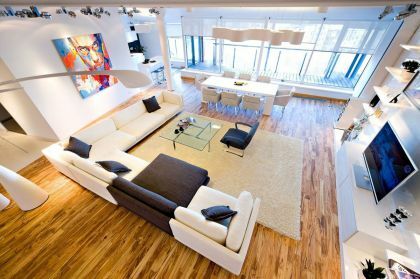 Polish architect firm Moomoo has recently completed the interior design of this modern loft located in Lodz, Poland.